Exhibit hall and e-posters at BES 2018. In December, Frontiers in Ecology and Environment Editor In Chief Sue Silver and I traveled to Birmingham, UK, to represent ESA at the British Ecological Society (BES) 2018 annual meeting. In addition to having complementary missions, BES and ESA have a long-standing relationship – BES will exhibit at ESA annual meetings, and its members regularly attend as well. This was the second time that ESA has exhibited at a BES meeting. 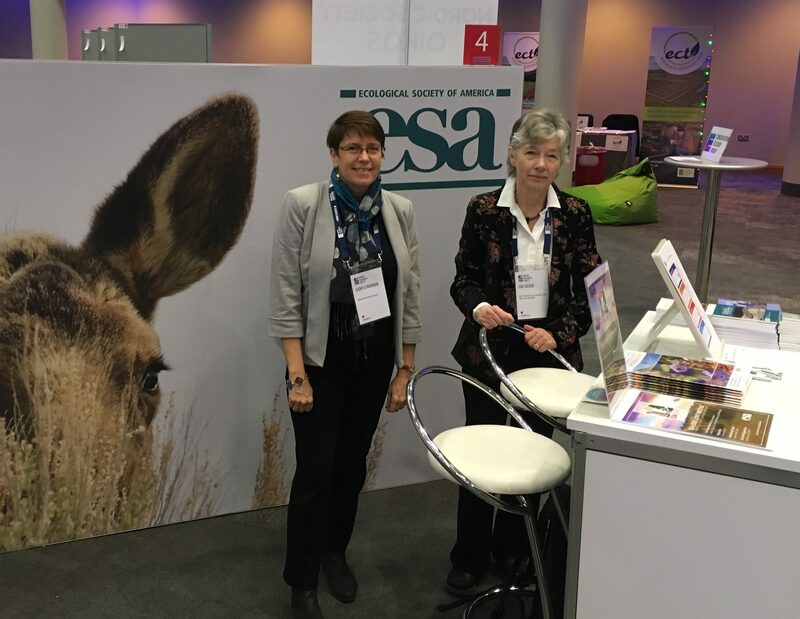 Frontiers in Ecology and the Environment Editor in Chief, Sue Silver, and ESA Executive Director Catherine O’Riordan, represented ESA at the booth in the BES exhibit hall. Reflecting an international draw from Europe and beyond, over 1100 delegates from 42 countries attended the meeting at the International Convention Centre from December 16-19. This annual gathering of BES members provides a forum for Society members, staff, and guests to share their research and discuss the implications of their science. The architecture and many of the accents were British, but the meeting felt much like one of ESA’s – students were enthusiastic and vibrant, senior scientists were animated about their results, BES leaders were confident in the state of the society, and scientific collaboration permeated the conference center. The meeting officially opened the evening of Sunday, December 16 with a beer and wine reception in the exhibit and poster hall. Plenary talks were held each morning followed by time blocks of parallel thematic and interactive sessions. Poster sessions were held each evening starting at 5pm, kicked-off by lightning talks in which presenters had two minutes to summarize their research. There was no central theme for the meeting, but talks were organized into sessions that ranged from the smallest of scales (microbial ecology) to those much larger (macroecology and biogeography). Included in the mix were sessions on population ecology, species interactions, evolutionary ecology, agricultural science and policy, urban ecology, and others. The plenary talks stimulated quite a bit of discussion; especially interesting was the kick-off by Sam Gon of the Hawaii Nature Conservancy, who began with some traditional Hawaiian singing, followed by speaking about the natural history of the Hawaiian Islands. It’s clear that BES members also place a high value on outreach to local communities – the Tuesday plenary featured Danielle Lee, from Southern Illinois University, who spoke about her experience incorporating local students into her research on urban marsupials (especially rats!). Ken Thompson also gave an excellent plenary talk Wednesday on the “12 months of ecology” – his personal selection of the important ecology issues from the past year. Each plenary was followed by an informal session where student and early career members had the opportunity to discuss ideas with the speaker in a small group setting. The BES booth was busy with delegates drawing their study organisms. The exhibit hall was particularly lively, with activities including an area devoted to “draw your organism,” a “speed dating” session with BES journal editors where participants could pitch a paper, and e-poster sessions as well as traditional poster sessions in the late afternoons. There were even Ping-Pong and foosball tables to keep attendees active and engaged between scientific sessions. Delegates at BES2018 take a break from sessions and posters to play some Ping Pong. Sue and I met quite a few ESA members at the meeting, and a number of delegates expressed interest in ESA journals and programs. We were very glad to have attended and hope to have ESA representation at future BES meetings. If you missed the meeting, stay tuned as BES will be launching “Ecology on Demand,” a streaming service that includes recordings of plenary and other talks from their 2018 meeting.